Your blog should have a quick and easy way to subscribe (whether via RSS or via email). I recommend Feedburner for this. They provide you with an html form for capturing email as well as something they call a “Chicklet Chooser” for providing readers subscription options via RSS. Of course you can also use a tool like Aweber to deliver posts via RSS and, you can use it as an email newsletter as well. Keeping tabs on subscribers can give you some good insight on who’s reading your blog and the progress your making over time. Think about what you want your readers to do. What “action” do you want them to take upon landing on your site? Do you want them to use your home search tool? Do you want them to submit a registration form for your newsletter? What do you want them to do and are you making it easy for them to do so? Not the sample sidebar on the right, if you want to search for homes, that’s the first thing you see: “Quick Home Search”. We talked about how to organize your categories effectively before (read: How To Use Categories Effectively On Your Blog). Basically, you want to give readers a way to easily sift through your content. The easier it is for them to find what they’re looking for, the more likely they are to stick around the blog. Having you written a Post Series? Something like a 3 part series on the Mortgage Application Process? This is something you want readers (especially new readers) to be able to reference easily. You could use something like the “Popular Posts Plugin” to do this or with a little bit of html, you can put your own “Featured Posts” in there using a simple text widget. 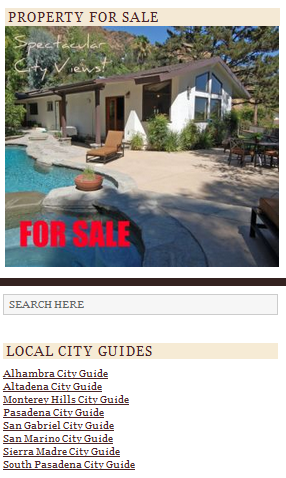 PasadenaViews.com: Irina does an excellent job of displaying all of her recently sold listings using a simple text widget that scrolls through both her properties that are currently for sale and her recently solds. Each image links to a blog posts where she writes in detail about that listing. As a new site visitor, you know she’s a productive agent, and you get to see some of her work first-hand upon landing on the home-page. TheMortgageReports.com: You can go anywhere to get lending information (your local bank, your local broker, etc.). But Dan’s been featured in the news including several newspaper and radio appearances. He shares that openly on his site but do you know why? Because it establishes him as the local expert! Anything else that takes up your sidebar can simply be considered clutter. In fact, I’m of the opinion that the less you have on your sidebar, the better. Just think about what’s most important, and focus on displaying that information above the fold so that when people land on the page, they can see it clearly. If you want to display any additional information, like affiliate ads, etc. by all means do. But I wouldn’t place those before your Home Search and subscription options. What do you think? What are some of the most important elements that should go into your sidebar? Did I miss anything? More importantly, how does your sidebar look and how can you clean it up and improve it? This post makes me think that I need to spend some time fixing up my sidebar! I think a call to action button would be a great idea. The social proof is also something I’m missing. @Mike: Start by putting some thought into what “Action” you want your site visitors to take once they land on your site. That should be the first Call To Action people should see when they get there. So if it’s “Search for Homes” I should see a badge that indicates for me to click there in order to search or it should be an actual “Quick Search” widget. I’ve blogged for a long time and always made sure my sidebar was user-friendly – you are serving a lot of different types of readers and the side bar can really help them navigate through your world – so while some may like to cruise through categories others may find archives more useful. Thanks for the comment. In regards to categories versus archives, I see your point. When I read sites like Copyblogger.com, I like to dig through the archives to see some of their past work (it’s useful, and it’s fun to dig through). However in this case, since we’re referring to real estate blogs in particular, real estate is timely meaning the market changes each and every day. So I’d argue that Categories are much more important/relevant than a list of archives. Don’t you think? Thanks for your comment Malita! Loving #5 Social Proof ~ have to incorporate that . However as you said less is more !